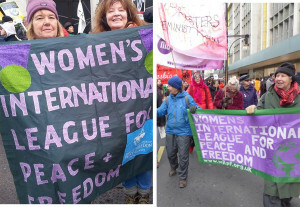 WILPF UK relies on the work of volunteers and donations to help with the organisation’s running costs, particularly in maintenance of an office. Your donation would be much appreciated and will enable us to continue with our work for international peace and freedom on behalf of women everywhere. However, if you decide to help UK WILPF, your donation is much appreciated. Because of our campaigning work WILPF UK cannot be a charity, and so gift aid does not apply to donations to WILPF UK. There is a WILPF Charitable Trust which must work as a separate entity to comply with the law. The WILPF Charitable Trust is a registered charity supporting human rights work. The Trust also administers the Mary Alys international travel fund, which was set up following Mary’s death to support the costs of travel (to international WILPF meetings and events) for members in countries less well off than the UK. Mary was deeply committed to WILPF and particularly the work that can be achieved by bringing women together from all over the globe and from different backgrounds to study, share and make known the causes of conflict – so important for ensuring women’s voices are heard. Following our 100th Anniversary in April 2015, WILPF is continuing to facilitate a truly global discussion and to look for ways to make changes and address the issues, whether economic justice, disarmament, environmental, social or political. There is so much to do, and we have women in Sections all over the world who can shape this work. We appeal to you for support. If you are a UK taxpayer, your donation is worth up to 25% more* and is a tremendous boost of funds for WILPF. *Please tell us if you wish your donation to be processed for Gift Aid at no extra cost to you.